Find ‘TimeTable’ icon on its dashboard and click it. Set the preferable shortcode settings. Set the amount of columns. If you select certain columns only, all events of the selected columns will be displayed in the timetable. Select the events to display in the timetable. If you select certain events only, all the chosen events will be displayed in the timetable. If you select certain columns and certain events at a time, the selected events only will be displayed in the selected columns. Select the event categories to display in the timetable. If you select certain categories only, all the events of these categories will be displayed in the timetable. If you select certain columns and certain categories at a time, the events under the chosen categories will be displayed in the timetable. If you select certain columns, events and categories at a time, the events under the chosen categories will be displayed in the chosen columns (additionally, uncategorized chosen events). Choose the hour measure (1 hour, half hour, quarter hour). Set the filter style: drop­down list or tabs. Specify the filter label for All Events. Set the certain event parameters: display/hide title, time, subtitle, description, and user. Tick Yes to disable Event URL. Specify the event text alignment: center, right, left. Assign a unique ID if you are going to use several timetables on a page. 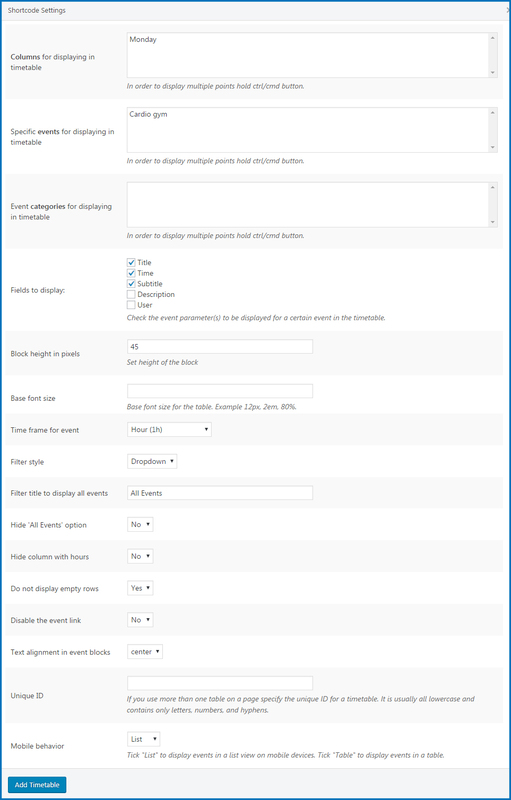 Set Responsive option to Yes (a horizontal scroll bar will be removed on desktop and the list view will be set on mobile devices) or to No (the horizontal scroll bar will be displayed on desktops and mobile devices). how can I change the font size of the elements inside the table? If I change the font size in the code, only the upper row gets changed. The plugin inherits the styles of paragraphs, titles, etc. from your template. If you wish to override the style of some element you need to inspect its selector (class or ID). Then apply custom CSS via Child Theme or Additional CSS box under Customizer. Thank you for your question however I’m not sure I got your question properly. Actually the timetable can be added using shortcode and its parameters which are described at Dashbaord>TimeTable>Help section. I would like my columns to have the same width, but it is now define by the width of the title column. Could you help me ? Hi! I have a lot of different events at the same time, but at different venues. Though in the timetable they get stacked onto each other, making the timetable hard to read. Any fix for that? Thank you for your question. There is option to increase height of the row so it will make timetable more convenient for reading. Come faccio ad aggiungere nella home pagine una tabella? It depends on your theme layout. If there is content part available you should simply go to edit the Home page and place a timetable there. if there is some custom layout in your theme you can contact your theme provider asking them how to add shortcodes to the front page of that theme. hi, please can you provide some shortcode to vertically center align the event text. At present it is all bunched up at the top and I would like it to be in the middle. I tried text_align_vertical=”center” but it dodnt work. Thanks. It will be hidden for all timetables on this website. In case you need to hide different rows for certain table you can add custom class to timetable shortcode and add it before mptt-shortcode-row-0. How do I change the sequence of the cell information, let’s say I wish to display time first, followed by Title and subtitle. I tried changing the shortcode sequence but that didn’t work. You can override plugin files following developer guide. \wp-content\themes\your-theme-folder\mp-timetable\shortcodes\ folder and modify it to change position of time, title, subtitle, etc. in the timeslot of the schedule. I don’t see this icon, what to do? Make sure Visual Editor is enabled in profile of your WordPress user/account and it is possible to switch between Visual and text editors (tabs).